Buddy’s buddy, riding what looks like one of my old boards, gets the tail bit off by what, a bull? Looks like a tooth from a bull, yeah. I've seen bulls launching chasing mullet at Flatrock the last week. Saw a shape surfing the Point today. He would have been going pretty fast when it's had a go. Pretty crazy, really. Someone saw some sharks and dolphins feeding off the peg at boulders Saturday, and apparently someone lost their board at O.P and had to swim in at boulders that day too. I thought I saw one in a wave in main part of town on sat. Didn't look like a dolphin to me. Pretty sizey too. May-June last year is when GWS tagged numbers increased significantly on the mid-north Coast. Plenty of pings at Forster and Port lately. The theory they’ve been down south (Eastern Vicco] for summer and move north during the cooler months will gain a bit more evidence yay or nay. DPI marine biologist says it's a white. I went riding with him in the hills near Perth a few times, he’s quite mad. Footpaths are where it’s at, legal here too. Yeah cause the DPI have really got the shark issue sorted. I remember Shearer speaking to Vic Pedomore and he had no idea from what I can recall. Last edited by swvic on Mon Jun 04, 2018 11:18 pm, edited 1 time in total. No, it's a white tooth. Thats one thing thats easily ID'ed. Pretty fcuking impressive strike hitting a kiteboard at speed. Very narrow base for a white, but it could be from a juvenile, before they swap to mammals. Normally they are more of an equilateral triangle shape, without the raised central portion. Mind you, my sense of scale is all shot to bits by comparing it with that cloven hoof. 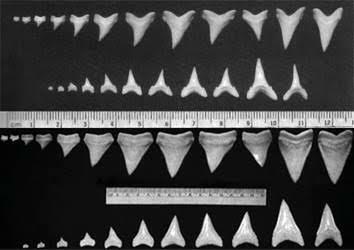 Bottom jaw, juvenile great white. it's a nice looking tooth. ancient palm beach literature reads; if bequeathing a great white's tooth in oceanic waters by way of incident, one must wear it around thy neck for total immunity from further Selachimorpha consultation.